This is a public service for foreign visitors provided by Okinawa Prefecture. 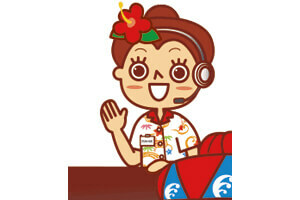 It provides tourist information, interpreter services and caring support for travelers in emergencies. Please contact us if you have any inquiries about tourism in Okinawa either before or during your trip. Service is free of charge. There will be call charges only. What are the transportation modes to the hotel? During my stay, what are the events held? Are there any recommended tourist spots? Do you have any information for the isolated islands? I need some restaurant information. *We will not provide your personal information to a third party in the absence of your express approval. *Please wait for a while until a person in charge contacts you by e-mail. *Please be forwarded that it may take several days to respond to you depending on what your inquiry is about. *Please be forwarded that we might not be able to respond to all inquiries. *Please make sure you type your email address very carefully as a mistyped e-mail address will probably result in our message going to the wrong person. *We are sorry to say that we are not able to answer any questions unrelated to tourism in Okinawa because we do not have a specialized knowledge of the relevant subject which please note. Please input the alphanumeric characters of five characters that are displayed.